Dead Dead Demon's Dededede Destruction Vol. 3 Review – AiPT! Everyday life goes on in the face of alien invasion. If I had to sum up Inio Asano’s Dead Dead Demon’s Dededede Destruction in a phrase, it would be “the intersection between the ordinary and the extraordinary.” The series takes place a few years after a giant spaceship appeared over Tokyo, and Japan has been in a state of political and economic flux ever since. Even as the military hunts aliens and nations debate proper courses of action, however, average citizens must go about their everyday lives in the aftermath. That sense of pushing forward is especially crucial to the latest volume, as the protagonists mourn the death of one of their friends and prepare to graduate from high school. Vol. 3, published by Viz Media, collects chapters 17-24 of the manga. Does this installment live up to the unique charm of the series’ premise? One of the most immediately striking aspects of this manga is how highly detailed Asano’s art is. There are countless shots of city skylines and alien technology that just astound with their abundance of lines. The world the characters inhabit looks very realistic, which helps reinforce the series’ tone and themes. The protagonists are coping with all the changes the aliens’ invasion has wrought upon society, and life feels busier and more serious than ever. Thus, it’s appropriate that the visuals are busy with details to match this sense of anxious hustle and bustle. The actual characters, meanwhile, aren’t always rendered as realistically. The protagonists usually are, even to the point of looking unflattering–which is a nice change from a lot of other media’s emphasis on beauty. Minor characters, however, are often drawn in a cartoony style with exaggerated facial features. This has a comedic effect while also more or less reducing the characters into narrative props. On occasions like this the characters are often spouting opinions on political or social issues, and so they become stand-ins for the views themselves. The main characters feel more fleshed out in comparison, as they stumble and make choices amidst various social movements and pressures. Occasionally the minor characters’ comedic appearances get extreme to the point of being inappropriately over-the-top, but as a whole Asano’s strategically inconsistent styles work well together. Fortunately, the writing in this volume is as well thought out as the artwork is. The characters take part in all manner of seemingly normal activities, and in doing so they reveal a lot about life in the wake of alien invasion. On one hand, life goes on–human society doesn’t crumble all at once, so the protagonists still have classes, college entrance exams, and more to deal with. On the other hand, there’s no ignoring a giant spaceship literally hanging above your head at all times. Previously serious subject matter becomes more comical, resulting in flippant commentary on capitalism and great lines like “I’m gonna study hard in college and become a high-spec wage slave!” There is also some poignant commentary on how to cope with mourning and uncertainty while coming of age in an era where little seems definitive. 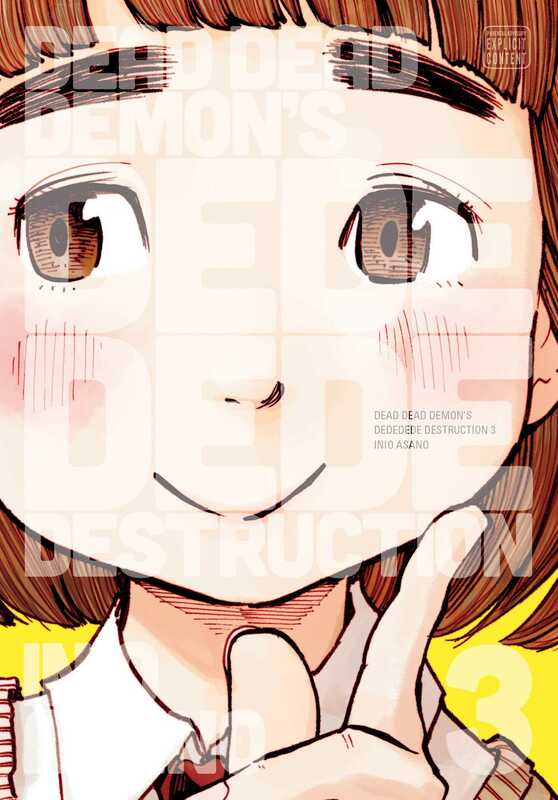 Overall, Dead Dead Demon’s Dededede Destruction Vol. 3 is impressive and enjoyable on almost all counts. Asano’s vision of everyday life in the face of invasion is both poignant and comical, and its visuals perfectly reflect the series’ themes. There are occasions where the comedy undercuts the story a bit too much, but very little else is wrong here. I would recommend this volume to anyone. A poignant and funny volume that pulls you into the protagonists' busy and anxiety-inducing world.